Home / Blog / UK Parliamentary Debate on South Korean Dog-Meat Trade: agreement that UK Representatives will take positive action to address the issue with South Korean Counterparts. 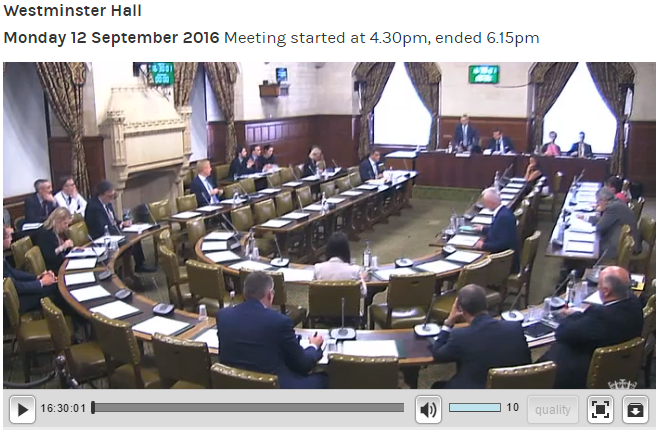 On September 12, 2016, the UK Parliament held a debate on the South Korean dog-meat trade. The UK citizens had ‘spoken loudly’ by securing this historic debate through a Government Petition, which gained over 100k signatures, and through making their feelings known to their MPs. Many of those MPs, from various cities and political parties, and from various countries within the UK, personally presented their own and their constituents’ views. Many speakers pointed out the need for taking a ‘sensitive’ approach when dealing with this issue with Korea, as any perceived hypocrisy or insensitivity (not acknowledging the current political worries) could be counter-productive. It was also recognized that, to bring an end to this cruel practice, change should come from within, and that it cannot be brought about through ‘preaching’, but rather through encouragement, cooperation, education and best practice exchange, etc. The consensus, therefore, was that such action must be taken and support given to Korea, in particular to those people in their country (politicians as well as animal welfare etc. groups), who are already trying to bring about change. I am sure that South Korea wishes to be seen as a country that has many great and interesting cultural practices, and not merely one that is widely known for its heartless killing and eating of animals that are universally considered to be friends, and even family members. This is a very encouraging outcome, and I am grateful to the UK citizens who have spoken out and also to their Government for listening to the concerns of their people. I have a great sense of respect for the UK as a nation, and I hope to see the same kind of empathy from the US, and other nations around the world, and that they will also stand against that which is unjust and immoral. We look forward to updates given by the UK Foreign & Commonwealth Office about their follow-up action and results achieved. Click HERE to for the transcript of this meeting. Click below to watch from UK Parliament TV. 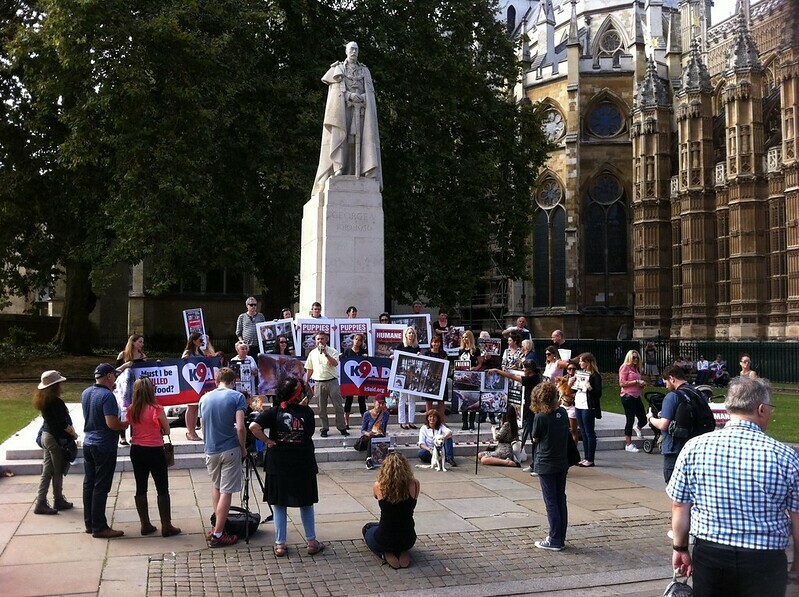 Below are photos by Madeline Warren who organized a Vigil held in front of the Westminster before and during the Parliament meeting. Click HERE to see more photos from this event. Click HERE to read BBC’s report on this meeting “Ministers to press for South Korea dog trade reforms”. I am proud of the UK for their stance against this horrific act against companion animals in Korea. I am so sad to have witnessed so many in parliament leave the floor for this important promotion of suffering and torture. I am so proud of the stance you took to create at least an awareness to the government you are witness to. Dear God, save these dogs from the pain, suffering, torture, agonizing life of people who are so stupid, so stupid and lack such compassion for these dogs. Do they not see in the eyes of these dogs the sole and pain they feel. They must feel…………..something??? It is impossible to boil a dog alive with the eyes begging for help, their bodies shaking and suffering…………can’t they see it? In the eyes of these poor, innocent dogs? Shame on Korea, China, Taiwan, Cambodia etc. I have lost my love for God to let this go on. I have not lost my respect for the people who oppose this. Thank You UK….Thank You Parliament. We are so lost in this world to let this go on. STOP CRUAUTE!!!!!!!!! SHAME ASIE!!!!! STOP BARBARIE! our pet dogs human friends and cats !!!!! This has been going on for almost forty years!!!!! Thank God at last people are listening and trying to do something to save these poor babies! ESTA BARBARIE NOS HACE PERDER EL SENTIDO DE VIDA Y AFECTA A TODO SER HUMANO DE ALGUNA MANERA. TODA ESTA BRUTALIDAD QUE SE LLEVA A CABO EN ASIA CORROMPE LA MORAL DE LAS SOCIEDADES EN EL MUNDO, ALTERA EL ORDEN Y DESTRUYE LA ESTRUCTURA ÉTICA EN EL PLANETA, ROMPEN CON EL EQUILIBRIO EMOCIONAL Y FOMENTAN EL ODIO Y LA VIOLENCIA. Korea has strong nationalism and animal discrimination due to Confucianism.No one, including animal protect groups, thinks about animal rights alone.